Steve Monsulick '07, assistant coach of the UNH Nordic ski team, takes on other alumni and coaches at the UNH Winter Carnival in Jackson, N.H., on Saturday. The alumni and coaches' race followed the collegiate races at the Eagle Mountain Golf Course. Shortly after the collegiate skiers were done tearing up the Nordic trails at the UNH Winter Carnival on Saturday, it was time for the alumni and coaches to take their turn. The rules for the annual Alumni and Coaches Race are simple: Have fun. No whining. Race for your school’s honor. And while no one was keeping score or recording times, the UNH Nordic alumni and coaches made a strong showing, rallying four Wildcats to take part in the 2.5 kilometer race around the Eagle Mountain House Golf Course in Jackson, N.H.
Katie Miller '11 races in the alumni and coaches race. 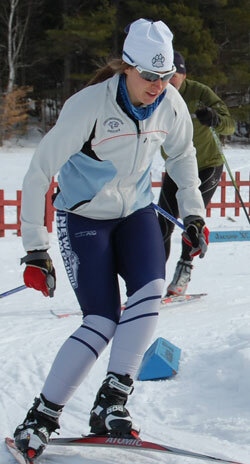 Miller, now a UNH graduate student in justice studies, volunteers to help coach the UNH Nordic team. The race is a unique tradition for the UNH Winter Carnival, which brings together the strongest collegiate teams in the Northeast for two days of alpine and Nordic competitions in the Mount Washington Valley. UNH finished third overall in team scoring against 15 schools, behind the University of Vermont and Dartmouth. Thompson also serves as a coach for The Northeast Passage Adaptive Nordic Ski Team, which often trains with the UNH team. Steve Monsulick ’07, who now works at the assistant UNH Nordic ski team coach, still races on his own and at a high level. But the alumni and coaches race, he says, is more about getting together with former teammates, coaches, and competitors from other schools and enjoying a little good-nature ribbing. “It’s a short race, but just long enough to remind you what the pain of racing is all about,” Monsulick says. Other veteran UNH alumni lining up were Katie Miller ’11, who is now a UNH graduate student in justice studies and a volunteer coach for the team; and Sarah Walker, a former assistant coach. The UNH Wildcats took third in the carnival, which featured two days of alpine and Nordic racing against the best teams in the Northeast. Learn more.